For most Americans, at least those paying any attention, the threat of Homeland Security (HSD) and its Gestapo agenda represent a far bigger threat to the nation than some nameless, faceless, unidentifiable person or group in some foreign land. Created on the back of the fear mongering by our own government using 9/11 as the excuse, this trophy of the Bush regime is morphing into the greatest threat we face which is exactly what it was intended to do. According to HSD these days . . . we are all unique terrorists, each of us representing a threat to the ever expanding global efforts to end human rights except for those afforded to the elite. Somehow, those who possess great wealth, those who operate as a corporation, are somehow exempt from regulation and government sponsored terrorism. Out here in no-man’s land where jobs have been systematically shipped out of the country to slave labor markets and where the homeless population is rising daily as a result of massive unemployment, and while our border remains unsecured and millions of illegal immigrants are encouraged to enter the country further depressing the job market and wages across the board, it seems we have no rights as these are being eroded on a daily basis not only by our elected officials, but also by Homeland Security, an unelected bureaucracy loaded with over paid bureaucrats. HSD is a Constitutional black hole. HSD now claims that violence does not have to be part of the criteria for defining terrorism or for defining you as a terrorist. You just have to simply object to what government is doing. Maybe you joined a group which meets and discusses the abuses of power, the abrogation of rights, or the preferential treatment afforded the affluent and corporations. Maybe you realize that all of our rights, our freedom and liberty are being taken away under the false premise of “it’s the only way we can keep you safe”. Too bad for you! You are now a “unique terrorist”. This last one would have made me laugh had it not been for the attached “plot attacks on commercial food production facilities”. This was added on to the fear mongering over gardeners and livestock owners in an attempt to tie those who grow their own food to, terrorism. What is clearly an episode of government brainwashing, our law enforcement is being trained to connect growing a garden and/or raising livestock with plotting attacks on corporate industrialized farming and ranching operations. This has to be one of the biggest stretches of fear mongering to come along in some time. It is apparent the government does not approve of us growing our own food but can’t come out and criminalize it in and of itself (although “Dirty Harry” Reid (D) made a valiant effort to do just that with his fake food safety bill) so a fictional connection has to be made between gardeners and livestock growers and potential attacks on corporate producers. There! Are you scared of your local farmer or maybe your neighbor, now? While I would like to think and believe that our law enforcement officials would be smarter than this I have only to look at the menace many of these departments across the country have become now that they are under HSD control. Add to this the military war equipment now being assembled by many departments and the now “badge heavy” and armed to the teeth personnel who are virtually operating with immunity no matter how many laws they themselves break and no matter how many of your rights are violated as the police state a.k.a. Homeland Security moves forward and the recipe for disaster is almost complete. The idea that Libertarian philosophies (i.e. 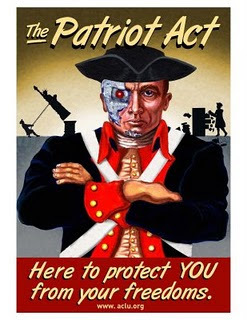 belief in a Constitutional Republic) and any belief expressed concerning your rights including the second amendment, along with acknowledging that Big Brother is not only a threat, but is here, are all viewed as “unique terrorist” activities. Thinking about all of this I of course have to wonder who is being terrorized by my belief in the Constitution? In what way does my belief threaten them? The answers of course are that the only individuals or institutions who view my beliefs as terroristic are the same individuals and institutions that operate the Big Brother police state. I don’t know how hard we will have to be hit in the head as a nation, but the terrorists we need to fear the most are all sitting in some very fine offices in Washington D.C.. As a country we are being systematically deconstructed as privately owned corporate agencies, all created by government, all unlawfully empowered to write and enforce laws they make up themselves (rules and regulations, codes are lawmaking) take more of our freedom and rights away from us, virtually criminalizing everything we could possibly do. Once this power is transferred by congress to the privately owned corporate agency, neither congress, nor the president can dictate to them what they can or cannot do. They may only make suggestions which do not have to be adhered to. The only power congress has at this point is defunding the agency or program. Not that it makes much difference, as an autonomous private corporation, these agencies can and do contract with other corporations even against the interests of the people. As always, what bothers me most is the willingness of some Americans to slap on a government badge and forget who they are and where they come from. I suppose it shouldn’t be a surprise that so many are willing accomplices in the government sponsored terrorism that is eating away at the core of our country. History is full of these cowards who will do anything to save themselves even if it means harming you. What better place for a coward to hide than behind a government badge?